Arenal is world’s first and only producer of innovative ceramic ultrasonic (non-nuclear) spectroscopy and thermal analysers for the determination of Slurry Density, Specific Gravity, Total Suspended Solids, flow, massflow and temperature of abrasive and high concentration slurries. The ceramic sensor constructions not only provides the best acoustical and thermal physical properties but also it provides the highest degree of hardness ensuring optimal abrasive resistance for the high demanding applications in this industry. Until now, slurry density recording in the mining industry is often being performed with risky and expensive nuclear densitometers. With the introduction of the ultrasonic slurry density analyser of Arenal, the density recording can now be performed in a more secure, user-friendly and highly accurate manner, while saving costs and allowing for quicker interventions. Measuring slurry flow is in most cases performed with magnetic flow meters from other brands. Except for iron ore and ferro solicate applications, this technology does not work well. Arenal re-invented the well-known thermal massflow meter. 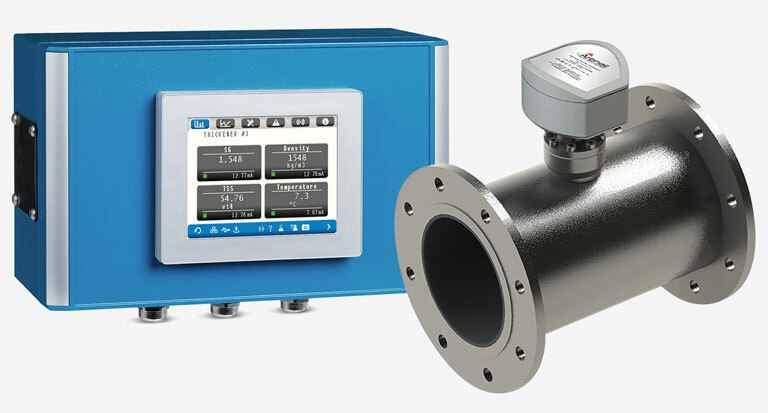 In combination with the slurry density analyzer, the flow and massflow can be determined now with the same accuracy as with magnetic flow meters, but for a much lower price and without the need for maintenance! Ultrasonic spectroscopy is used to monitor concentrations and density for all mining and industrial slurries and pastes. For each application Arenal offers suitable mounting solutions and calibration models. Ceramic Thermal massflow sensors are used to monitor abrasive slurries and pastes. However, due to density changes, the thermal conductivity of such slurries change. This is compensated when the technology is combined with the ultrasonic slurry density analyser. "Arenal strongly believes that process Analysers with disadvantages like reagent use, nuclear issues, erosion, short lifetime, high cost will be eliminated from the plant floor sooner or later. Therefore, Arenal invests mainly in physical property sensors, which have proven to be of very good quality." As a supplier of instruments for online, real time and non-nuclear monitoring applications, Arenal PCS closely cooperates with manufacturers of plant and process monitoring systems to develop the best possible solutions for their monitoring and control needs.